Zafra-Calvo, N. Lobo, J.M. Prada, C. Nielsen, M.R. and Burgess, N.D. 2018. Predictors of elephant poaching in a wildlife crime hotspot: The Ruvuma landscape of southern Tanzania and northern Mozambique. Journal for Nature Conservation, Vol. 41, Issue. , p. 79. Aburto-Oropeza, Octavio López-Sagástegui, Catalina Moreno-Báez, Marcia Mascareñas-Osorio, Ismael Jiménez-Esquivel, Victoria Johnson, Andrew Frederick and Erisman, Brad 2018. Endangered Species, Ecosystem Integrity, and Human Livelihoods. Conservation Letters, Vol. 11, Issue. 1, p. e12358. Haas, Timothy C. and Ferreira, Sam M. 2018. Finding politically feasible conservation policies: the case of wildlife trafficking. Ecological Applications, Vol. 28, Issue. 2, p. 473. Holbech, Lars H. Annorbah, Nathaniel N.D. Phalan, Ben and Arcilla, Nico 2018. Uncontrolled hunting and habitat degradation decimate and extirpate forest hornbills in Ghana, West Africa. Biological Conservation, Vol. 223, Issue. , p. 104. Cheung, Hubert Mazerolle, Lorraine Possingham, Hugh P. and Biggs, Duan 2018. Medicinal Use and Legalized Trade of Rhinoceros Horn From the Perspective of Traditional Chinese Medicine Practitioners in Hong Kong. Tropical Conservation Science, Vol. 11, Issue. , p. 194008291878742. Büscher, Bram and Fletcher, Robert 2018. Under Pressure: Conceptualising Political Ecologies of Green Wars. Conservation and Society, Vol. 16, Issue. 2, p. 105. Verweijen, Judith and Marijnen, Esther 2018. The counterinsurgency/conservation nexus: guerrilla livelihoods and the dynamics of conflict and violence in the Virunga National Park, Democratic Republic of the Congo. The Journal of Peasant Studies, Vol. 45, Issue. 2, p. 300. Massé, Francis Lunstrum, Elizabeth and Holterman, Devin 2018. Linking green militarization and critical military studies. Critical Military Studies, Vol. 4, Issue. 2, p. 201. Brehony, Peadar Bluwstein, Jevgeniy Lund, Jens Friis and Tyrrell, Peter 2018. Bringing back complex socio-ecological realities to the study of CBNRM impacts: a response to Lee and Bond (2018). Journal of Mammalogy, Vol. 99, Issue. 6, p. 1539. Massé, Francis 2018. Topographies of security and the multiple spatialities of (conservation) power: Verticality, surveillance, and space-time compression in the bush. Political Geography, Vol. 67, Issue. , p. 56. Glynatsi, Nikoleta E. Knight, Vincent and Lee, Tamsin E. 2018. An evolutionary game theoretic model of rhino horn devaluation. Ecological Modelling, Vol. 389, Issue. , p. 33. Büscher, Bram 2018. From Biopower to Ontopower? Violent Responses to Wildlife Crime and the New Geographies of Conservation. Conservation and Society, Vol. 16, Issue. 2, p. 157. Moreto, William D. Brunson, Rod K. and Braga, Anthony A. 2017. ‘Anything We Do, We Have to Include the Communities’: Law Enforcement Rangers’ Attitudes Towards and Experiences of Community–Ranger Relations in Wildlife Protected Areas in Uganda. The British Journal of Criminology, Vol. 57, Issue. 4, p. 924. Barbora, Sanjay 2017. Riding the Rhino: Conservation, Conflicts, and Militarisation of Kaziranga National Park in Assam. Antipode, Vol. 49, Issue. 5, p. 1145. Runhovde, Siv Rebekka 2017. Comparing Discourse to Officer Perceptions: The Problems of War and Militarization in Wildlife Crime Enforcement. Critical Criminology, Vol. 25, Issue. 2, p. 275. KOPNINA, HELEN 2017. Commodification of natural resources and forest ecosystem services: examining implications for forest protection. Environmental Conservation, Vol. 44, Issue. 01, p. 24. Redpath, Steve M. Linnell, John D. C. Festa-Bianchet, Marco Boitani, Luigi Bunnefeld, Nils Dickman, Amy Gutiérrez, R. J. Irvine, R. J. Johansson, Maria Majić, Aleksandra McMahon, Barry J. Pooley, Simon Sandström, Camilla Sjölander-Lindqvist, Annelie Skogen, Ketil Swenson, Jon E. Trouwborst, Arie Young, Juliette and Milner-Gulland, E. J. 2017. Don't forget to look down - collaborative approaches to predator conservation. Biological Reviews, Vol. 92, Issue. 4, p. 2157. The militarization of anti-poaching: undermining long term goals? Alexander, J. & McGregor, J. (2000) Wildlife and politics: CAMPFIRE in Zimbabwe. Development and Change 31: 605–627. Ayling, J. (2013) What sustains wildlife crime? 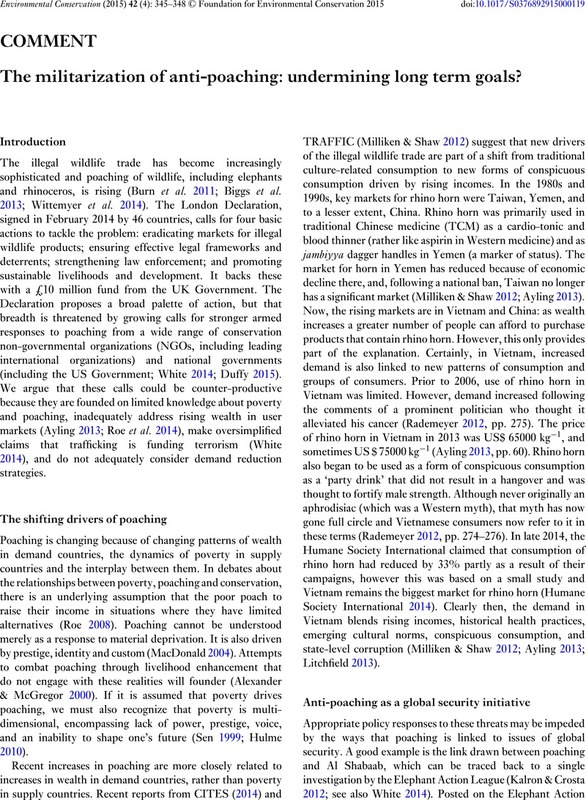 Rhino horn trading and the resilience of criminal networks. Journal of International Wildlife Law and Policy 16: 57–80. Biggs, D., Courchamp, F., Martin, R. & Possingham, H.P. (2013) Legal trade of Africa's rhino horns. Science 339: 1038–1039. Brockington, D. (2002) Fortress Conservation. The Preservation of the Mkomazi Game Reserve, Tanzania. Oxford, UK: James Currey. Burn, R.W., Underwood, F.M. & Blanc, J. (2011) Global trends and factors associated with the illegal killing of elephants: a hierarchical bayesian analysis of carcass encounter data. PLoS ONE 6: e24165. Challender, D. & MacMillan, D.C. (2014) Poaching is more than an enforcement problem. Conservation Letters 7: 484–494. Duffy, R. (2015) War by conservation. Geoforum (in press). Ellis, S. (1994) Of elephants and men: politics and nature conservation in South Africa. Journal of Southern African Studies 20: 53–69. Hilborn, R., Arcese, P., Borner, M., Hando, J., Hopcraft, G., Loibooki, M., Mduma, S. & Sinclair, A.R.E. (2006) Effective enforcement in a conservation area. Science 314: 1266. Hulme, D. (2010) Global Poverty: How Global Governance is Failing the Poor. London, UK and New York, NY, USA: Routledge. Humphreys, J. & Smith, M.L.R. (2011) War and wildlife: the Clausewitz connection. International Affairs 87: 121–142. Leakey, R. & Morell, V. (2002) Wildlife Wars: My Battle to Save Kenya's Elephants. London, UK: Pan Books. Litchfield, C.A. (2013) Rhino poaching: apply conservation psychology. Science 340: 1168. Lunstrum, E. (2014) Green organization: anti-poaching efforts and the spatial contours of Kruger National Park. Annals of the Association of American Geographers 104: 816–832. MacDonald, K. (2004) Developing ‘nature’: global ecology and the politics of conservation in northern Pakistan. In: Confronting Environments: Local Environmental Understanding In a Globalising World, ed. Carrier, J., pp. 71–96. Lanham, MD, USA: AltaMiraPress. Milburn, R. (2012) Mainstreaming the environment into postwar recovery: the case for ‘ecological development. International Affairs 88: 1083–1100. Neumann, R.P. (2004) Moral and discursive geographies in the war for biodiversity in Africa. Political Geography 23: 813–837. Rademeyer, J. (2012) Killing for Profit: Exposing the Illegal Rhino Horn Trade. Cape Town, South Africa: Zebra Press. Roe, D. (2008) The origins and evolution of the conservation-poverty debate: a review of key literature, events and policy processes. Oryx 42: 491–503. Sen, A. (1999) Development As Freedom. Oxford, UK: Oxford University Press. White, N. (2014) The ‘White Gold of Jihad’: violence, legitimisation and contestation in anti-poaching strategies. Journal of Political Ecology 21: 452–474. Wittemyer, G., Northrup, J.M., Blanc, J., Douglas-Hamilton, I., Omondi, P. & Burnham, K.P. (2014) Illegal killing for ivory drives global decline in African elephant. Proceedings of the National Academy of Sciences USA 111: 13117–13121.